This is a nice RV park, with very clean restrooms and a good laundry. The sites are decent sized, although the layout is unusual. A nice dog run is provided. There is a coffee shop in the office. My rating would be higher but for the fact that we were assigned to a spot outside of the main park, on the street with no shade. This was in spite of the fact that they were never full in the entire month that we were there, and also after we had requested a change on several occasions. Evidently the more desirable spots are reserved for shot term visitors. I would not return for this reason. We camped at Silver City RV Park in a Travel Trailer. We were told $30 cash $33 credit card. Checks are $3.00 a night more. The trailers are packed on top of each other. Dogs are an issue. The camp hosts were friendly and the neighbors were friendly. We camped at Silver City RV Park in a Travel Trailer. Sorry for your unhappiness, but lets's be completely truthful here. Number one, When you made your reservation, you gave us an incorrect size for your rig and my work campers had to fit you in a site that we would not normally assign to a rig your size. Second, we give a "cash discount." The reason we give a "cash" discount is because cash saves us the merchant as well as the check fees that our bank charges. It's business, not personal. We've never had a complaint about giving a discount. Our sites are not on top of each other. We are an in-town park with limited land. That's why you can walk downtown from our park. When we get the correct rig size, we assign an appropriate spot. Nice, quiet park. Our site was tight for our 36 ft. travel trailer and was a back in site. Very hard to get into due to railing along the restroom/shower facilities. Would stay here again if could get a pull through. Most spaces are taken up by permanent renters. We camped at Silver City RV Park in a Travel Trailer. Helpful, friendly staff. Park is located one block off one of the main streets and within walking distance of a grocery store and several restaurants. Camper spaces are quite close together and maneuvering room somewhat restricted. Normal nightly rate is $33 but cash payment resulted in $30. We stayed three nights and would return. We camped at Silver City RV Park in a Travel Trailer. This is a very nice campground and the location is perfect for seeing the many sights this area has to offer. Sites are gravel and neat and the hookups all worked fine. Wi-Fi was reliable and fast. The staff was very friendly and helpful and suggested several places to visit too. Fast food and groceries are within easy walking distance too. We'd definitely stay here again. We camped at Silver City RV Park in a Travel Trailer. Pull through site was level. No need to level. WI-FI was free for 7 days and worked well. Staff was extremely accommodating. Roads and sites are easy to set up in. Camp K-9 was very good. There are trails around the back of the KOA that are nice to walk on with your dog. Sewer hook up is on concrete island so I needed blocks and a board to get a down hill sewer run. Nice park. I would stay here again if passing through. We camped at Silver City RV Park in a Travel Trailer. Nice shady, well maintained in-town RV park with various sized spaces. Friendly and helpful staff. Near old town and stores. Has on-site gourmet coffee cafe. Quiet. We camped at Silver City RV Park in a Travel Trailer. Silver City is a nice small town with lots to do. This RV park is as downtown as you will get, but quiet. The park has clean and heated showers and restrooms. There is a laundromat that only charges $1.00/load. Many great restaurants. Received Version and DIV. We camped at Silver City RV Park in a Travel Trailer. This is a small CG in the middle of town. Great value. Spotless bathrooms and laundry. Quiet. Close to all the amenities. We had planned to only stay for 2 days, but there is so much to see and do in the area that we stayed for 4 days. Friendly and helpful hosts. We would stay here again. We camped at Silver City RV Park in a Travel Trailer. Other reviews accurately capture what's great about this park: location, tidiness, friendliness. In addition to a charming downtown, complete with live theater, white-linen restaurants, a brewpub, and greasy spoons, a short walk away, there is a Market Basket practically at the gate. We wish more parks were located so conveniently to the towns they serve. The smallish gravel sites each included a picnic patio and table, a tree or two, and a board fence around three sides. This park would be a ten, if only it had a pool and spa! We camped at Silver City RV Park in a Travel Trailer. We spent five nights here with four boys. This park is close to everything, the owners and hosts are very friendly and helpful. The park was very quiet and clean, there was also plenty of shade. We would spend more time here again. 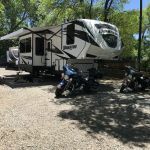 We camped at Silver City RV Park in a Travel Trailer.